The Silk Group has been involved in promoting the wonders of silk to the public for the past 30 years in forms of media including internet, TV, radio and the press. If you would like to obtain press statements, publications, access to our library of press-quality photographs and video please contact us. This page showcases our news and some of the media the Oxford Silk Group have been featured in. For our own peer-reviewed publications, see the Publications page. For our own other media output please use the links to the left. The Silk Group in a European wide collaboration with the University of Sheffield, Universidade Nova de Lisboa, VTT Finland, Aarhus University, Leibniz Institut für Polymerformung, Oxford Biomaterials and Spinnova, are part of the Horizon 2020 EC grant FLIPT (Flow Induced Phase Transitions). This exciting collaboration will probe at the very heart of what makes silk an 'aquamelt', a water-protein complex that can transition from a soluble liquid state to an insoluble fibre by shear flow 1000 times more efficiently than artificial fibres. The discoveries made will then be put into functionalising other polymer sources, to allow for a variety of novel and unique biofeedstock sources to be utilised for fibre formation, leading to increased efficiency and lower energy costs in European fibre manufacture. Following an exciting 3yr International Exchange Project funded by the Royal Society we were successful in a collaborative application to the French Agence Nationale de la Recherche (ANR) by our Paris partners Profs Sebastien Neukirch, Arnaud Antkowiak, Regis Wunenburger, and our Bordeaux partners Prof J. P. Delville. This very generously funded ANR project is for 4 yrs, starting Oct 2014. The interdisciplinary study aims to establish bio-inspired technology derived from fundamental structure-function relationships seen in the orb-spider web glue droplets. This will be coupled with the development of novel analytical technologies. The team is seeking two PhD students to start in Sept 2015 at the University Pierre and Marie Curie in Paris and at the University of Bordeaux, France. Applicants are expected to have backgrounds and/or interests in bio-filaments, soft matter, the physics of droplets, or instrumental optics (laser). The PhD work will involve travel exchange between the Oxford, Paris, and Bordeaux groups and the students will be encouraged to take advantage of the international and interdisciplinary framework of the collaboration. For details on the project and positions please contact Prof. Sebastien Neukirch (Email: sebastien.neukirch@upmc.fr). September 2016 The Silk Group’s research into spider webs shows how spiders ‘tune’ their webs to transfer information about prey using vibrations. The work is featured in many news sources, including The Daily Mail, Oxford Mail and Materials for Engineering. August 2016 Spider silks are used to produce a ‘super lens’ that can see beyond the usual limits of visible light, allowing for high resolution, nanoscopic magnification, and the first time a biological material has been used as a ‘super lens’ View Here and View Here. July 2016 The Silk Group hosted a week long stand at the Royal Society’s Summer Exhibition, showcasing to the public the newest research in silks. 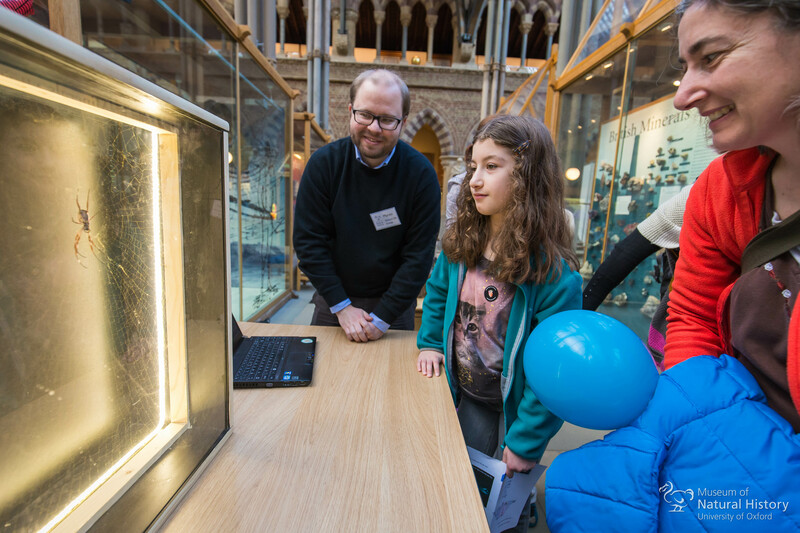 Events included computer simulations of spider web evolution, examples of medical devices derived from silk and even a performance of a violin made with spider silk!. July 2016 The Metro features the Silk Group’s video on spider reeling, showing how spider silk is collected for research.View Here. 7th July 2014 The Silk Group is greatly saddened by the loss of Prof. David Porter who passed away last week, when his heart suddenly gave out. 3rd June 2014 Beth Mortimer is interviewed on BBC Radio Oxford on her recent work on the vibration properties of silk. Listen here from 2:20:25. 3rd June 2014 Our collaborative work on the vibration properties of spider silks, published in Advanced Materials, finds that silks transmit vibrations across a wide range of frequencies so that its sound carries information about prey, mates, and even the structural integrity of a web. 29th May 2014 Our recent paper on the manufacturing properties of natural silk biocomposites is featured in a news story in the American Institute of Architects ARCHITECT magazine. 13th May 2014 Our recent paper on the manufacturing properties of natural silk biocomposites is featured in a news story in Materials Today. May 2014 Beth Mortimer's science journalism piece, 'The softer side of nature: caterpillars inspire new-age robots', is published online at the Society of Integrative and Comparative Biology. Read more. 3rd March 2014 Visit us on our SILK stand at The Big Bang Fair 2014 from March 15-16 2014 at the NEC in Birmingham, UK. 8th December 2013 Novel work on the electrostatic properties of spider webs is featured on The Independent and the Oxford Science Blog. View the video here. 3rd December 2013 The winter edition of EPSRC's Pioneer magazine features an article, 'Spin cycle', on current research on recreating silk synthetically, on an industrial scale. Read here. 31st October 2013 Novel work on plant latex features in articles on the Environmental News Network, Farming UK and Scientist Live. 12th January 2013 The Observer publishes an article on Fritz's research into spider silks here, with an accompanying video of spider reeling here. 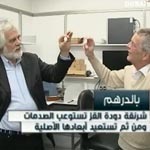 21st July 2012 Prof. Fritz Vollrath is awarded a prestigious Proof of Concept grant to accompany his ERC advanced grant. 23rd November 2011 In collaboration with the University of Sheffield we have demonstrated that natural silks are spun from aquamelts, and are a thousand times more efficient than common plastics when it comes to forming fibres. 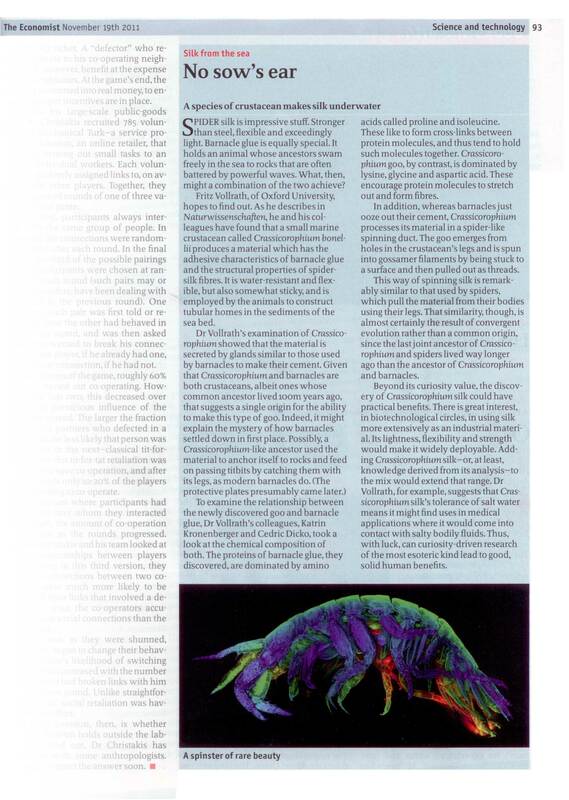 Paper and news item here, article in & Picture of the Day in New Scientist magazine. 24th May 2011 The breakthrough work by DPhil student Tom Gheysens on reeling silk from previously impervious wild silks from around the world is highlighted in the New York Times, who also briefly interviewed Prof. Vollrath about the pioneering technique. 23rd March 2009 We have just been awarded an EPSRC Next Generation Users Studentship to start October 2009. Details of this exciting 4 year Dphil and how to apply will be posted soon. 9th March 2009 Orthox, a spin out company from our group has been featured in The Engineer. Orthox has just received £1.6m in funding from the Wellcome Trust to make a silk protein-based knee implant. 15th May 2008 David Porter has just been made a visiting professor at the Department of Engineering Materials at the University of Sheffield. 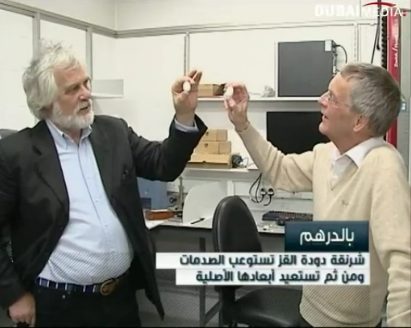 10th May 2012 Profs Vollrath & Porter are interviewed by Dubai business tv (from 10m40s), screenshot 1 2 on the possibility of making cocoons into composite materials after our paper on the subject. 2005 'Ahead of the game' Explorations Series 3 Episode 7: to watch go here navigate to 'watch a story' and then select episode. 2009 Science in Action: Using the ISIS Pulsed Neutron Source to study silk: BBC World service, 6th February listen.